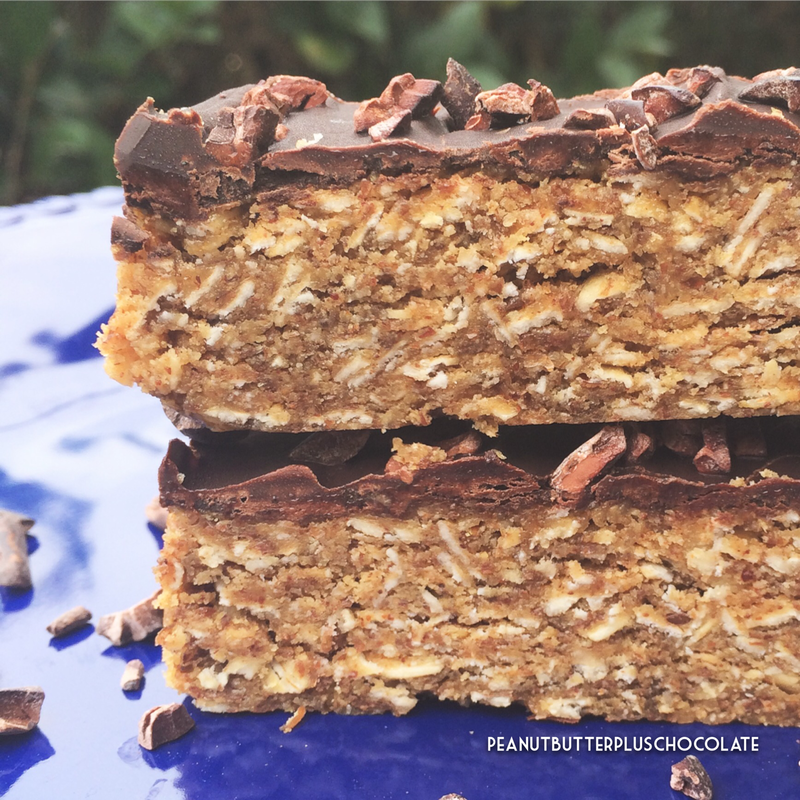 The Best Breakfast Bars You Will Ever Have! I absolutely love when things are simple and straight forward–especially recipes! I want all the ingredients to be in my kitchen ready to go. Let’s be honest, how often does that actually happen? Almost never, huh? 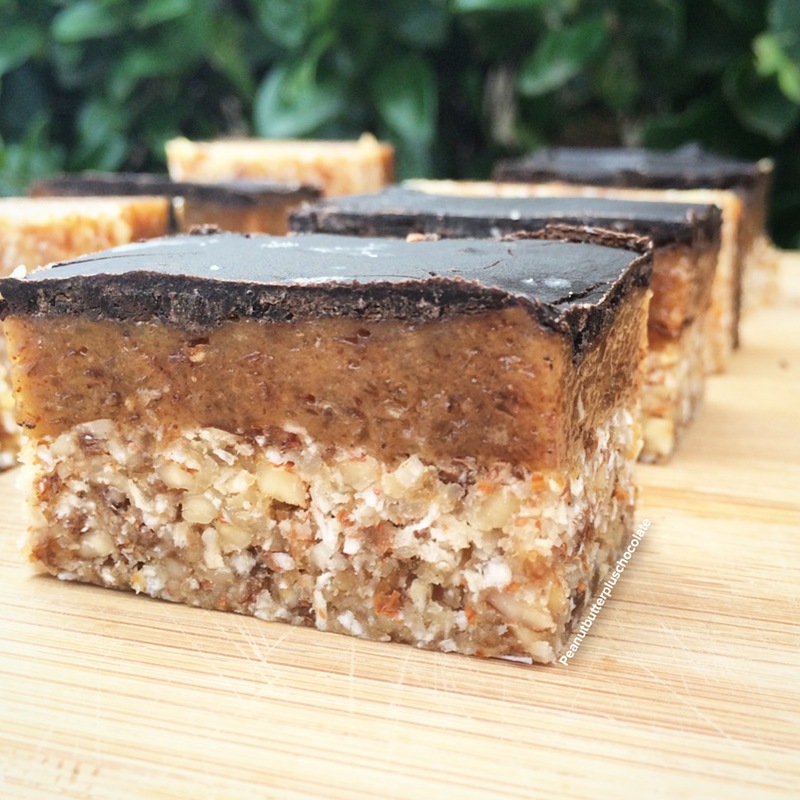 Well, that’s about to change after you take a look at my next recipe: Almond Butter Breakfast Bars–using basic health food ingredients. If you are a health nut like me, you will have every single one of these ingredients in your cupboard and if you don’t, I will give you a great substitute! I know eating healthy can get expensive so I wanted to share with you where I get all of my ingredients from: Vitacost.com. It’s an online super store and they sell everything health related: food, vitamins, supplements, protein bars and powders, diet products and even beauty and personal care. It’s the cheapest I have found and you can get everything in one big haul that’s delivered the next day! 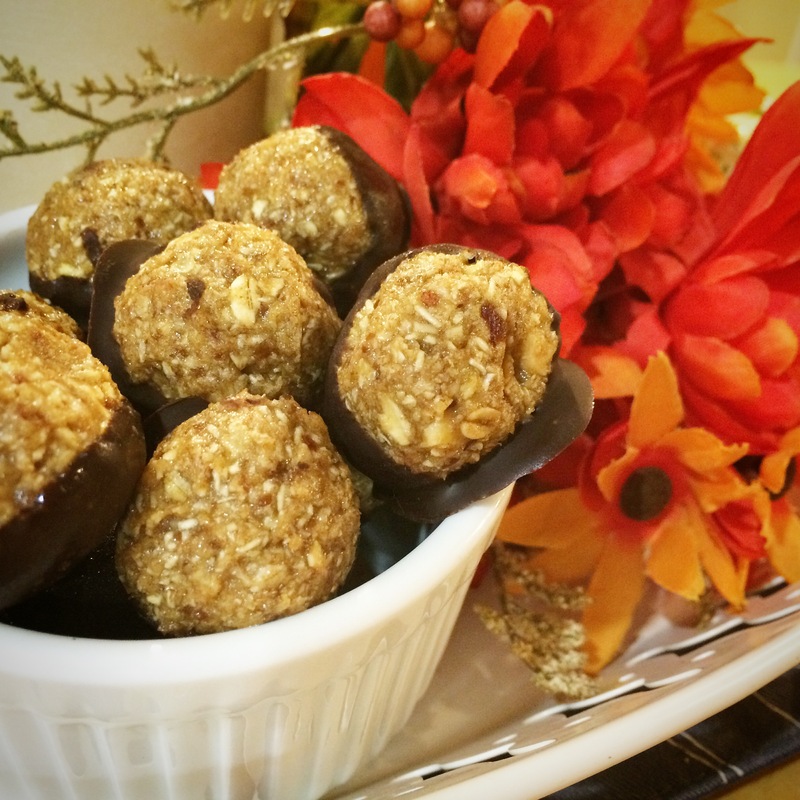 Oat layer: In a bowl mix together bar ingredients. Press dough evenly into a small loaf pan lined with parchment paper. 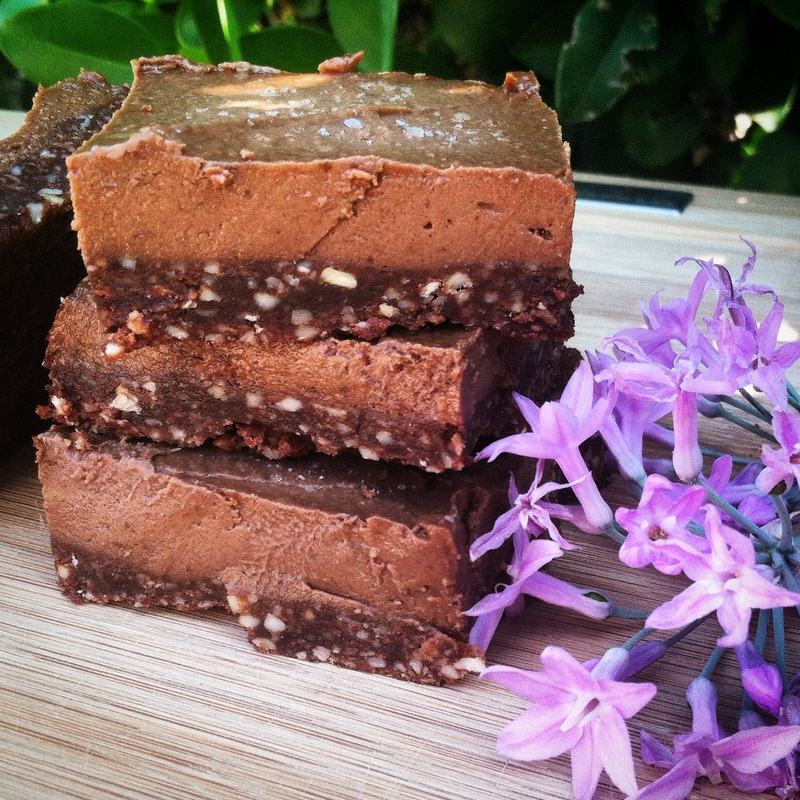 Chocolate layer: Melt coconut oil and honey together. Add cocoa powder and mix until combined. Spread a thin layer of chocolate over the oat layer and sprinkle with cocoa nibs. Place in the freezer for an hour to harden. 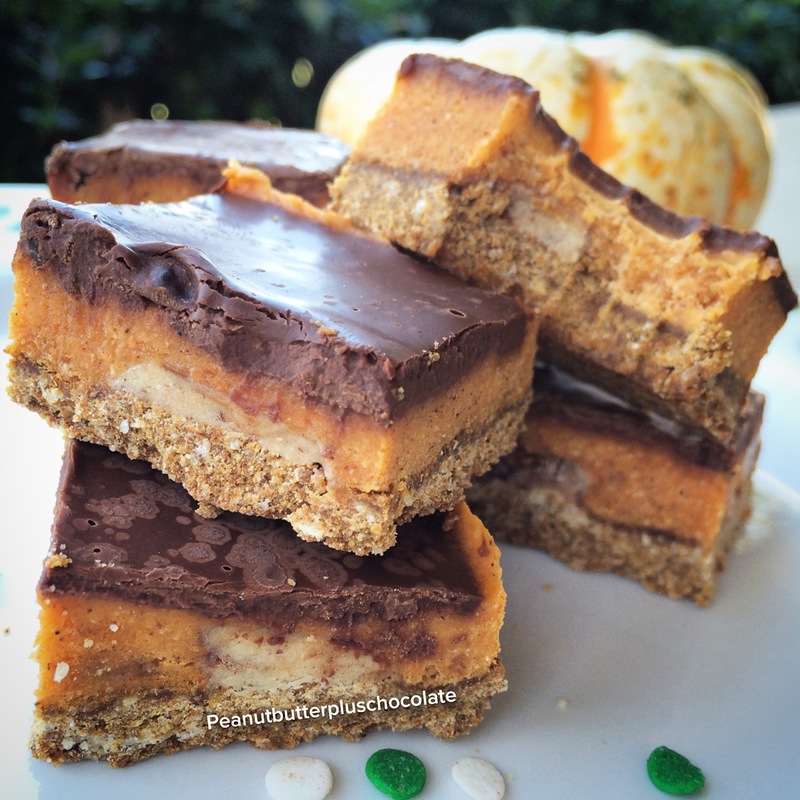 Cut into 4-6 bars and enjoy! 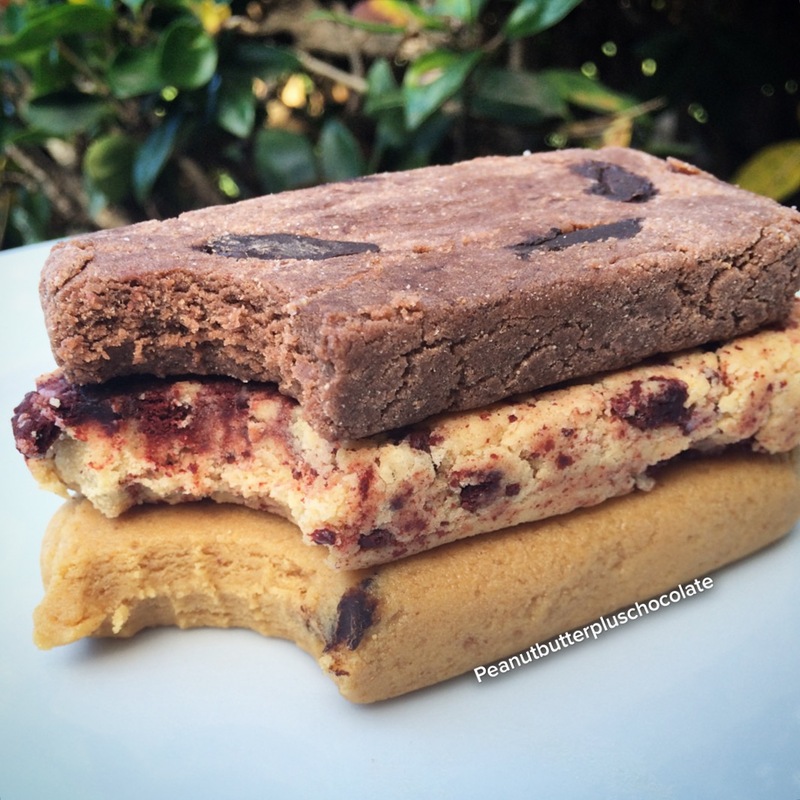 Red Velvet, Peanut Butter & Chocolate and Double Chocolate Chip DIY Protein Bars! Mix coconut flour, protein powder, powdered peanut butter and stevia in a bowl and set aside. In a small pan, on low heat warm the vitafiber and vanilla extract until small bubbles form. Turn off heat and slowly add flour/protein mixture. Mix as well as you can then pour mixture between a folded piece of parchment paper and kneed until mixed entirely. 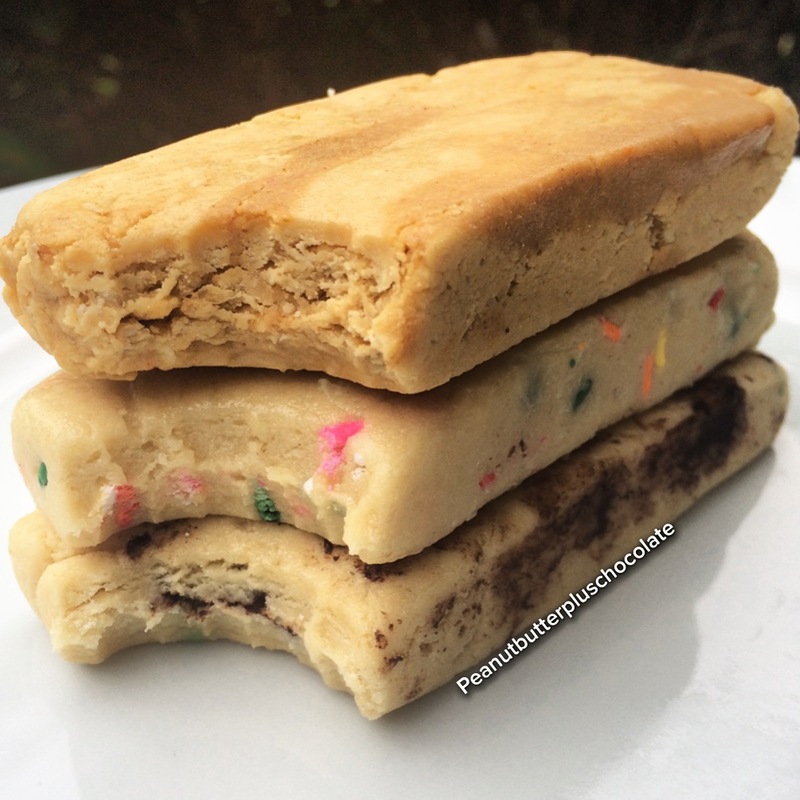 Mold into bar shape and press chocolate chips into the center and fold the bar over. Reshape into a bar. Store in an air tight container at room temperature. Mix together flour, protein powder and stevia, set aside. In a small sauce pan, heat vitafiber and extract on low heat until it bubbles. Turn off heat and slowly add flour/protein mixture and almond milk. Mix as well as you can then pour mixture between a folded piece of parchment paper and kneed until mixed entirely. Fold in crushed oreo. Mold into bar shape (I used two large knives to press and flatten). Store in an air tight container at room temperature. In a small sauce pan, heat vitafiber and extract on low heat until it bubbles. Turn off heat and slowly add flour/protein mixture and almond milk. Mix as well as you can then pour mixture between a folded piece of parchment paper and kneed until mixed entirely. Fold in chocolate. Mold into bar shape (I used two large knives to press and flatten). Store in an air tight container at room temperature. 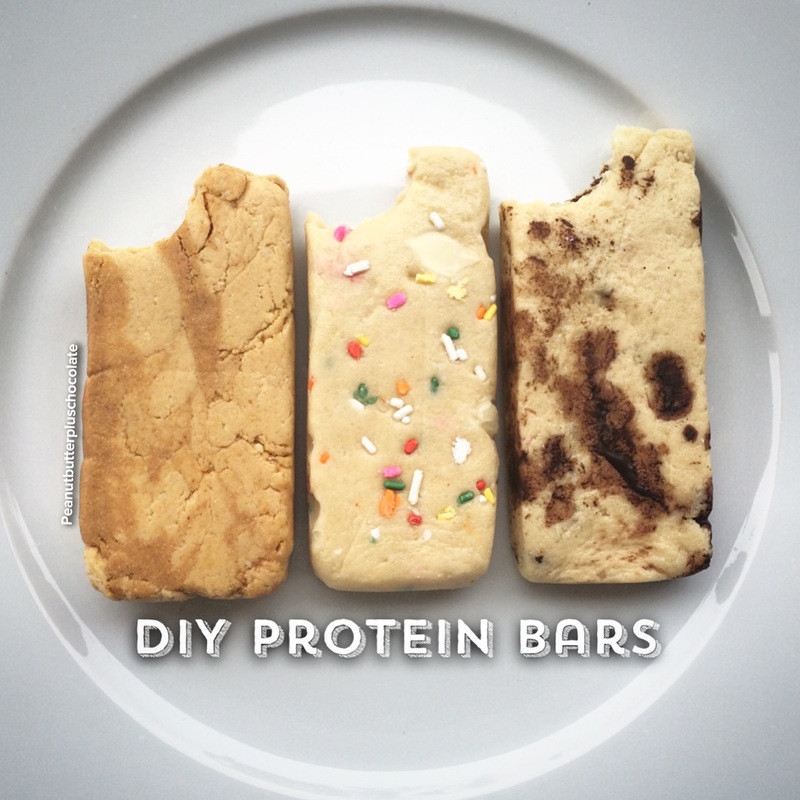 Who doesn’t love a protein bar? I for one, can go threw a box of Quest Bars in less than a week. My wallet is hurting so I had to start making my own. All of these bars have at least 27g of protein and 24g of fiber! 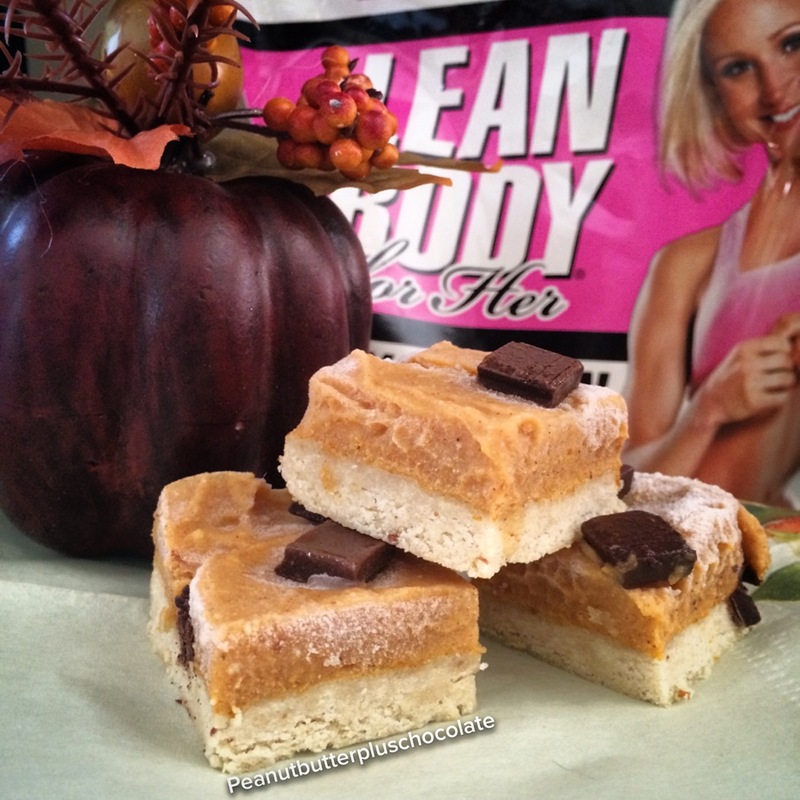 The base bar (before adding flavors) are under 300 calories and roughly 34g carbohydrates. 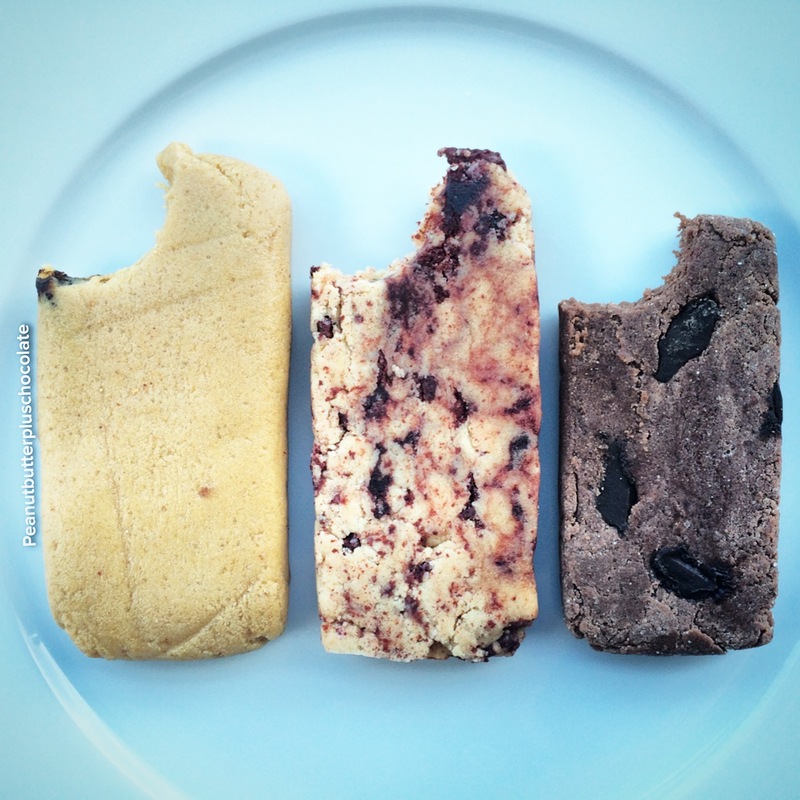 All of these bars include the magic ingredient: VitaFiber Syrup! (same as in a Quest Bar) VitaFiber is a magical syrup that is GMO-free, sugar-free, gluten-free and high in fiber! You can purchase it here http://vitafiber.myshopify.com/ I made three flavors. Each recipe makes one bar. In a small bowl mix together peanut butter and 1 tbsp. protein powder. Separate into 5-7 pieces, roll into ball and set aside. 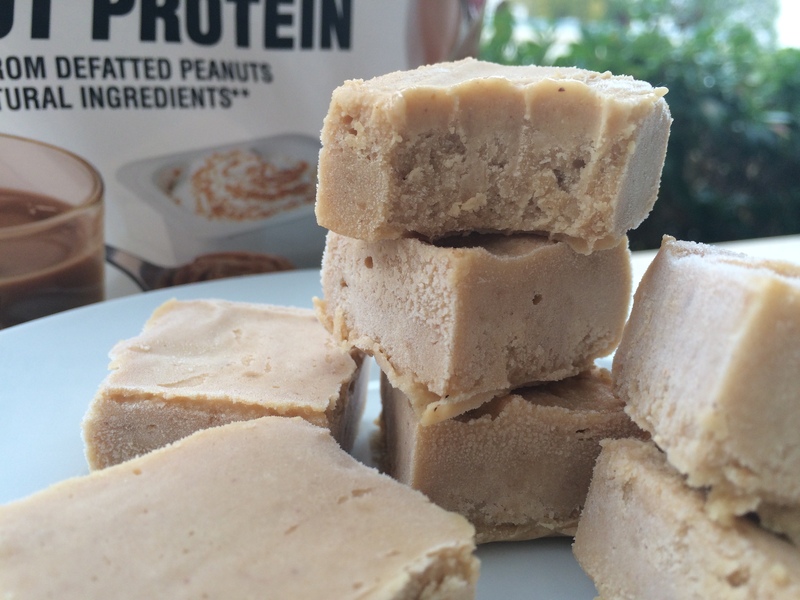 Mix almond flour, protein powder, powdered peanut butter and stevia in a bowl and set aside. In a small pan, on low heat warm the vitafiber and vanilla extract until small bubbles form. Turn off heat and slowly add flour/protein mixture. Mix as well as you can then pour mixture between a folded piece of parchment paper and kneed until mixed entirely. Fold in peanut butter balls. Mold into bar shape (I used two large knives to press and flatten). Store in an air tight container at room temperature. In a small sauce pan, heat vitafiber and extract on low heat until it bubbles. Turn off heat and slowly add flour/protein mixture. Mix as well as you can then pour mixture between a folded piece of parchment paper and kneed until mixed entirely. Fold in sprinkles and chips. Mold into bar shape (I used two large knives to press and flatten). Store in an air tight container at room temperature. In a small sauce pan, heat vitafiber and extract on low heat until it bubbles. Turn off heat and slowly add flour/protein mixture. Mix as well as you can then pour mixture between a folded piece of parchment paper and kneed until mixed entirely. Fold in chocolate. Mold into bar shape (I used two large knives to press and flatten). Store in an air tight container at room temperature. 🔸🔸Line an 8×8 inch pan with parchment paper. Place all base ingredients in a food processor and pulse until you have small moldable bits. Evenly press the base layer into your pan. Same instructions for the caramel layer. For the chocolate layer, melt coconut oil in a microwave safe bowl. Once melted mix in syrup/agave/honey. Then add cocoa powder and stevia (if needed). Pour evenly over caramel layer and set in freezer for 30 minutes before cutting into slices and serving. Mix all gingerbread ingredients together in a bowl. The mixture should be on the dryer side but able to mold. Press into a 8×8 inch pan lined with parchment paper.Bake for 10 minutes. Remove from oven and sprinkle quest bar evenly over gingerbread layer. Mix pumpkin ingredients together and pour evenly over gingerbread layer. Let cool in freezer while melting chocolate ingredients together. Pour evenly over pumpkin layer and let freeze for 1-2 hours. Enjoy! WARNING: These are highly addictive and only contains healthy, whole foods! Mix everything together until smooth. I used my mixer for this. Pour dough in a 8×8 inch pan lined with parchment paper. 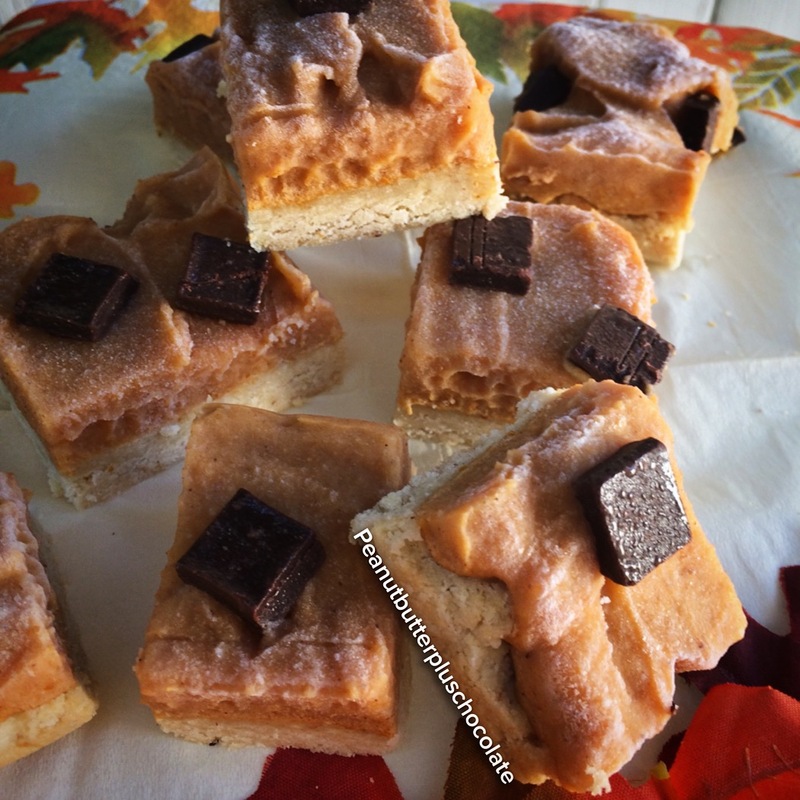 Freeze for 2 hours and cut into squares! Pre-heat oven to 375 and line a 8×8 pan with parchment paper. Mix all ingredients together in a bowl. It should seem fairly dry but when pressed together it molds. Press into pan and bake for 8 minutes. Let cool in the freezer while you make the pumpkin layer. Optional: Garnish with dark chocolate chips. Store in freezer and let thaw 5 minutes before serving. More MAPLE! I am kind of obsessed with Joseph’s Sugar Free Maple Syrup! Pumpkin is so last year, give me maple! Haha just kidding, I have a different kind of love for pumpkin. Like the kind of love you have for peanut butter and chocolate but would you would never choose sides. Forgot to mention that these puppies are RAW! So if you turned on your ovens, well then you just wasted about 3 seconds of you life. Sorry. In a food processor, pulse dates and oat flour until they form a paste then add remaining ingredients (old fashion oats being last) Roll into balls and place in an air tight container. Refrigerate for a couple of hours. Melt 1/2 Cup Dark Chocolate Chips with 1 Tbsp Coconut Oil. Dip your balls in halfway-all the way-whatever you want. Refrigerate until chocolate hardens and serve. Store in air tight container in fridge. Place all the nuts from the crust ingredients into the food processor and process until fine. Add remaining ingredients. Press crust into 9×9 in. pan (greased with coconut oil) OPTION: For a crunchy bottom layer, bake for 7-8 minutes at 375. Let cook while you make your second layer. Mix all ingredients for second layer in the food processor and process until you have a thick pudding like consistency. Pour over the bottom later and let set in freezer for at least 3 hours or overnight. Makes 15!